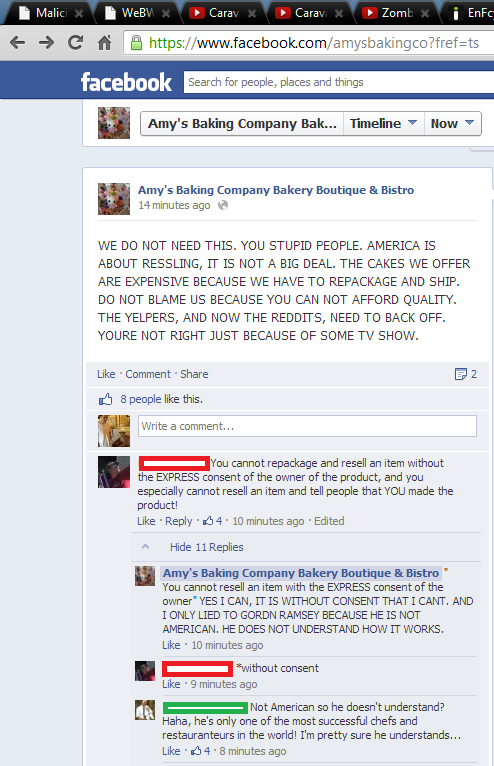 This is the Facebook page for Amy's Baking Company Bakery Boutique & Bistro, a restaurant in Scottsdale, Arizona. If you recognize the name of the restaurant, it was recently featured on an episode of Gordon Ramsey's Kitchen Nightmares. The owners were dumped by Ramsey after being too difficult to work with. Apparently, last night, owners Samy and Amy Bouzaglo took to the restaurant's Facebook to defend themselves against nasty comments from users. As they started posting, they started receiving nastier and nastier comments back at them. And the Facebook updates quickly spun out of control. 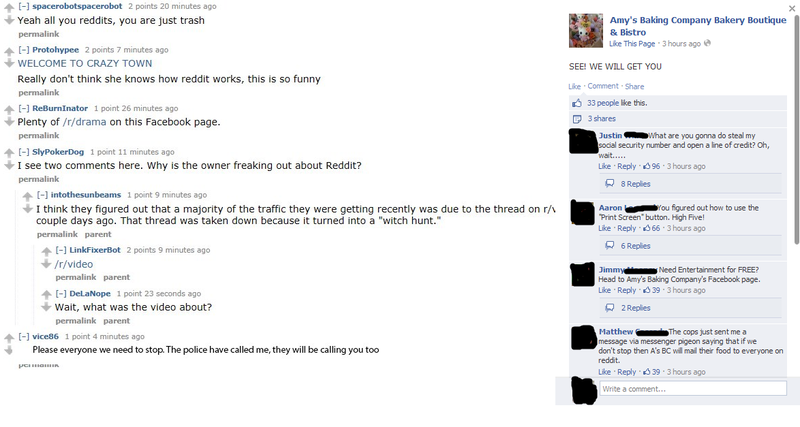 They discovered a Reddit thread posted to r/cringepics about their Facebook meltdown and started monitoring it. And the Reddit thread was, unfortunately, sending more unruly commenters to the Facebook page. The whole thing blew up. They then Photoshopped a comment thread from Reddit, claiming police were calling users. Finally, the updates stopped around 9 p.m. Monday night, with Amy and Samy calling all their commenters "punks" and saying they had "God on their side." The restaurant's reviews on Yelp are definitely not favorable. UPDATE: As of Tuesday night, Amy's Baking Company claim their social media pages were hacked and that they were not responsible for the comments on their page.